When it comes to image editing software for professional photographers and graphic designers, Photoshop CS5 is accepted, pretty much by everyone, as the industry standard – in fact, the term "photoshop" has made its way into mainstream English and is listed in modern dictionaries as a verb meaning "to alter a digital image." However, the high price tag and steep learning curve put CS5 out of range for most hobbyists and casual users. Thankfully, there are many excellent alternatives for those who want advanced photo editing capabilities but don't quite need the high degree of control and precision available in CS5. Adobe Photoshop Elements 9 is one of those alternatives. But, unlike CS5, Photoshop Elements faces some stiff competition coming from all sides in terms of usability, performance, and available features. 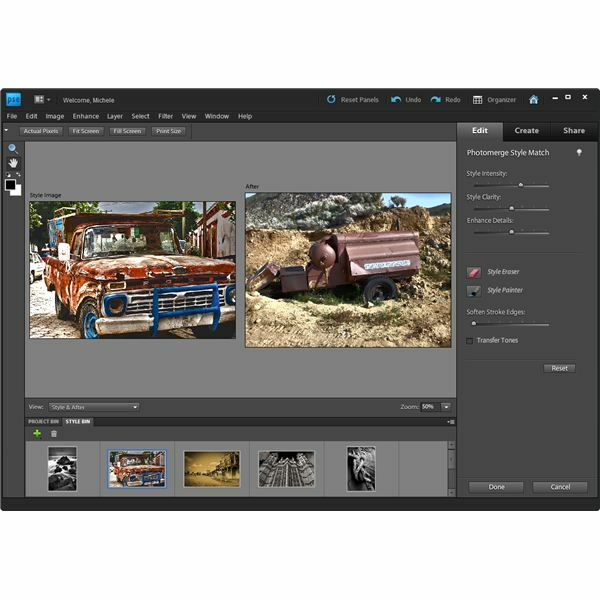 In this review, we'll rate Photoshop Elements 9 on each of these points and then look at how good a value the software presents. 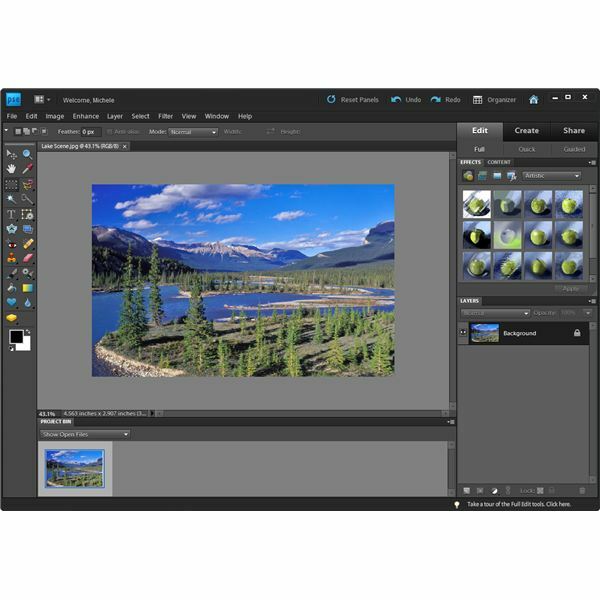 Like any feature-rich photo editor, Adobe Photoshop Elements 9 does have a fairly busy user interface, which may be somewhat intimidating to novice users. However, the software does feature an excellent Guided Edit tool so even the newest of users can jump right in and start making basic edits – such as cropping, adjusting lighting and exposure, enhancing colors, and performing touch-ups – fairly easily. In fact, several new Guided Edit options have been added to version 9, but we'll cover them in the next section. 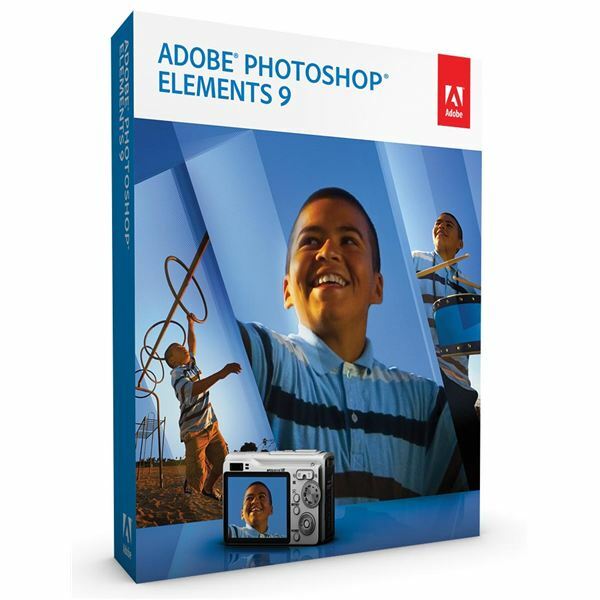 Also, Adobe TV has a very nice series of Photoshop Elements 9 video tutorials that cover a wide variety of topics. Even if you're an advanced user, you may want to check these tutorials out to learn how to access and use new features of version 9. Additional video tutorials can be found at Photoshop.com. If you have a specific question, you can access the Adobe Community Help screen from the Help menu on the main toolbar of Photoshop Elements. Then, just type your keywords into the search field and all related help files will appear. This information will open in a new window so you can refer to it while working on your image. 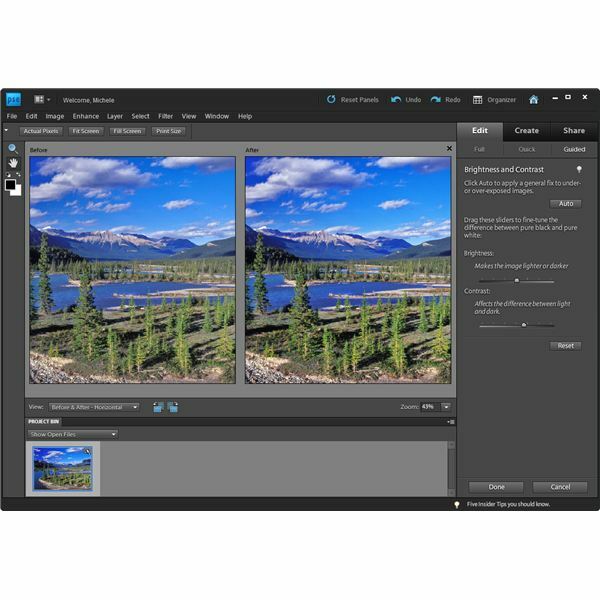 Of all the new features and enhancements found in Adobe Photoshop Elements 9, my two favorites are the new Guided Edit options and the Photomerge Style Match. Both of these tools walk you through the steps of applying some very advanced editing functions while letting Photoshop Elements do most of the heavy lifting. Within the Guided Edit tab, there is a group titled Fun Edits with five separate options: Lomo Camera Effect, Out of Bounds, Perfect Portrait, Pop Art, and Reflection. Each of these options combines multiple tools and techniques to achieve fantastic effects. For instance, the Out of Bounds option (pictured right) takes you through a few simple steps to easily create a very stunning 3D effect. Photomerge Style Match is another creative tool that lets you apply the style of one photo to another. If you have a particular image with great contrast, perfect lighting, or amazing detail, you can transfer that style to another photo simply by dragging that image to the empty box in the Style Match window. Photoshop Elements will analyze the image and apply its characteristics to your new photo. Afterwards, you can adjust the settings of the application to create a truly custom result. Other new features found in Adobe Photoshop Elements 9 include layer masks, the ability to upload photos directly to Facebook from the Organizer, Basic and Advanced design modes, and more flexible printing options. Although any graphics editing application is going to tap your system's resources pretty hard, some employ better resource management than others. 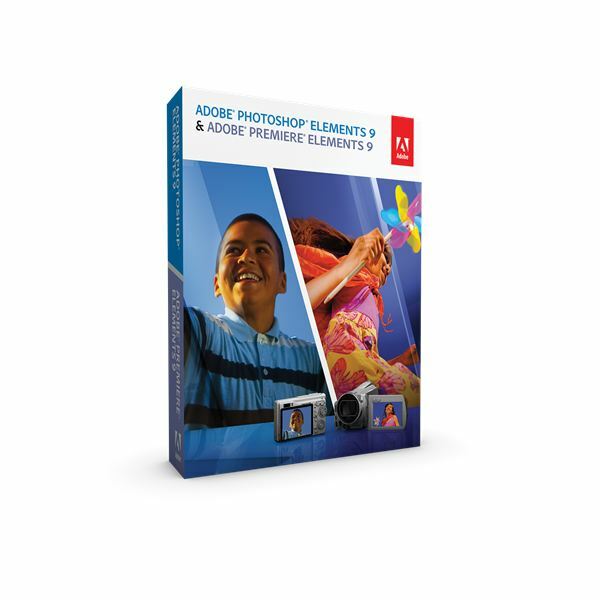 Overall, Adobe Photoshop Elements 9 does a very good job in this regard – most processes run quite smoothly with a higher than average response time. The program can get a little sluggish when you're working with larger images or files with several layers, especially if you're applying effects or textures to those images. 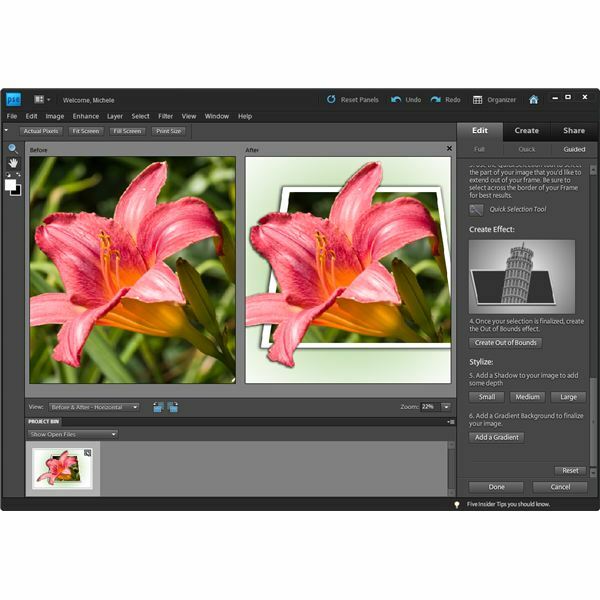 However, when compared to other photo editors in its class, Photoshop Elements 9 definitely ranks among the best when it comes to speed and performance. While Photoshop Elements 9 lists for $99.99, you can drop that price down to $79.99 if you take advantage of the $20 mail-in rebate offered by Adobe. That’s a firm, competitive price for photo editing software in the hobbyist niche market. If you’re also in the market for video editing software, you should consider purchasing the combo package that includes both Photoshop Elements 9 and Premiere Elements 9 for an even better deal. You can pick up both of these products together for $149.99, or just $119.99 after a $30 mail-in rebate – and that’s a real bargain. To get a better idea of the software's capabilities, you can download a free fully functional trial from the Adobe website. The trial version is valid for up to 30 days, so you'll have plenty of time to test all of the new features. I have to admit – when I first saw the list of new features and enhancements for Adobe Photoshop Elements 9, I was a little skeptical about how much value was being added to the release. But then, after trying out some of the new tools and seeing how powerful (and how much fun!) they really are, I was impressed. If you've never tried the software before – or even if you're a past user who hasn't tried it for a couple of years – take the time to download the trial and see how much it can do. Even if you currently use Photoshop Elements but are working with an older version, you may want to consider an upgrade so you can take advantage of the great new tools. Box shots courtesy of Adobe.